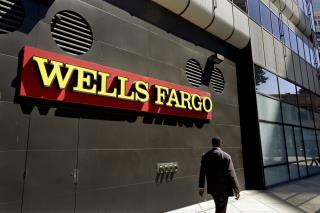 (Newser) – Wells Fargo has been fined $185 million over a scam that involved employees opening phony accounts for customers who were forced to pay fees, but the executive in charge of those employees will take home almost as much. Carrie Tolstedt, former head of community banking, will receive $124.6 million in shares, options, and restricted stock when she abandons ship at the end of the year. The bank announced her retirement in July, before the scam was revealed, reports Fortune. It can reclaim pay from executives linked to wrongful behavior but says it won’t do that with Tolstedt; it isn't clear if she was aware of the scam, though she ran the retail banking and credit card divisions from 2008. To get $125 million dollars when she should be in jail, unbelievable. It's really disheartening to the average person who works hard, scrimps and saves, just trying to make a better tomorrow for themselves and their family. If the general isn't in charge of the troops, aware of troop movements, and is ignorant of troop actions, the general isn't a general, and doesn't deserve the rank, or the pay that goes with the rank. So much for the much recited claim that senior executives are worth millions and millions in compensation. As most of us know, it's a scam. And think. here we are talking about electing a Wall street candidate. when its pretty easy to see that many people are fed up with the actions and power of that industry.